Many small business owners and entrepreneurs have no trouble focusing on how to build a product or on how to reach out to their consumers. However, many don’t know how to take their business to that next level. Small business owners need to actively monitor metrics to ensure processes are running smoothly and efficiently. Here are five, key inventory metrics small business owners need to be aware of in this competitive market. It may sound obvious but new or small business owners often overlook understanding gross margin. The gross margin is calculated as a company’s total sales revenue minus its cost of goods sold, divided by the total sales revenue, expressed as a percentage. Tracking margins is important for growing businesses, since increased volumes should improve efficiency and lower the cost per unit—or increase the margin. Improving productivity requires effort and innovation. The gross margin is calculated as a company’s total sales revenue minus its cost of goods sold, divided by the total sales revenue, expressed as a percentage. The smaller a business, the greater the pressure to get and keep inventory levels right on target. It’s important to track how much you have of any given product. Tracking your inventory levels helps you determine how much inventory you should have on hand, helps calculate seasonality, and helps you understand important aspects of your processes. 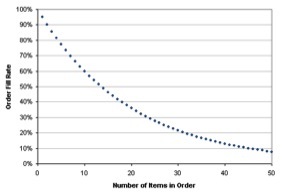 Regular inventory counts are a must, especially for items that generate most of your sales. In the broadest sense, fill rate calculates the service level between two parties. It is the percentage of items a customer ordered that your business was able to ship. The lower the ratio, the poorer your inventory performance. You should track the fill rate for each individual order and for all orders. And you should be able to answer the following question. What percentage of orders go out completely filled and what percentage have items missing? The cycle time clock starts when work begins on a request and ends when the item is ready for delivery. In a nutshell, the cycle time refers to the time it takes from when an order is first issued until it is completed. Cycle times can apply to various types of orders, including customer orders, purchase orders, manufacture orders, and more. You can break this down into smaller cycles, such as the time it takes to process a purchase order to detail a more precise analysis. The key of inventory turnover is to use the cost of goods sold—meaning what was paid for the material, not for what the material was sold. The inventory turnover ratio tracks how quickly you’re replacing inventory. Business owners want to prevent storing too much inventory in a warehouse. The higher the inventory turns, the better the business uses its inventory assets. With an inventory tracking system from Wasp, you can dramatically increase profitability and accurately track inventory without extra expense. Related Article: What is Inventory Turnover Ratio? Everything you need to know! Don’t start from zero to monitor your metrics. Wasp Barcode Technologies can help take your small business to the next level with innovative and affordable barcode software packages to assist your managing, tracking, and organizing of inventory assets. Spend your valuable time analyzing and understanding your company’s metrics instead of spending time worrying about how to accurately track your inventory.